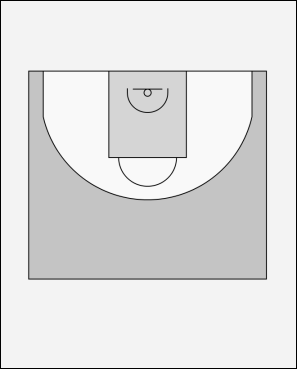 After the Catch, Square-Up and Shot-Fake (CSUSF) from the previous sequence, 3 passes back to 1 and cuts to the low-block, leads to elbow, then out to the wing again where he receives a pass back from 1. He does CSUSF. When 3 passes to 1, 1 should have just completed a Replace-Yourself cut and CSUSF. After 1 passes to 3, 1 executes a Replace-Yourself cut. When squaring-up on the inside foot (See NB of #1) with a triangle cut, use a reverse pivot RIPPING the ball through past the defender to the hip, knocking the defenders hands away with your "ripping" elbow.